In this episode, Max Keiser and Stacy Herbert discuss the currency war masquerading as a 'storage plan,' the Bond Kings threatening the gold repatriating Germany with having a Libya done to them and the Mexican taco stand in Florida advising customers to invest in silver. In the second half of the show, Max Keiser talks to Doug Casey of CaseyResearch.com about German gold, Glenn's Gulch and future war. [KR395] Keiser Report: Welcome Home German Gold. 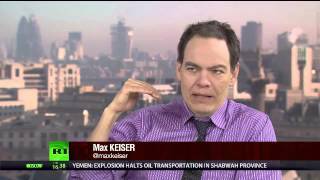 Posted on January 19, 2013 by Max Keiser. Glenn Beck: What really happened to the German gold housed in the United States?